This nice double apartment is situated in a quiet area near the historic center of the wounderful town Taormina. With its 270 sqm living space and its 110 sqm terrace space it offers enough space for 8-12 persons. The house consists of 2 apartments that belong together and share the patios. Therefore this double apartment is suited perfectly for 2 families or groups of friends, who want to spend their holidays together but still retain their privacy to a certain degree. 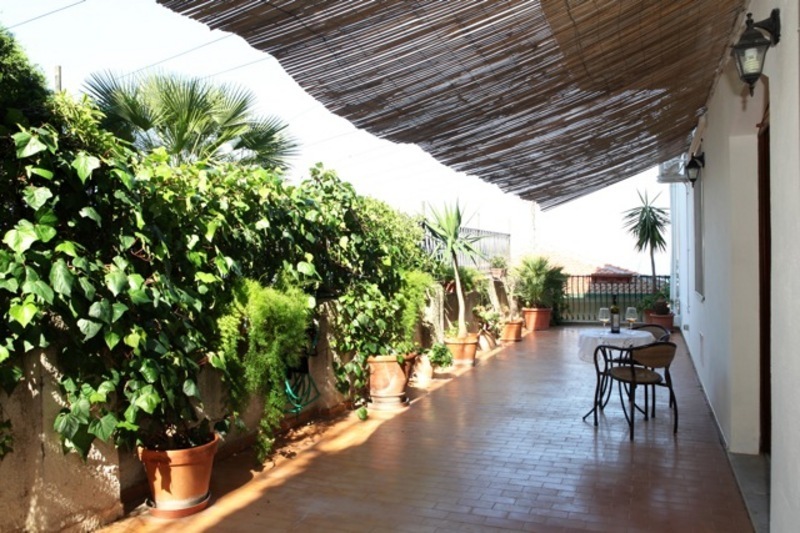 Both apartments have a separate entrance and can be rented singolarly. If you travel by car, you have the opportunity to park your car right in front of the house, since parking places exist. The first apartment has 4 rooms. You have a spacious, light-flooded kitchen to your disposal that offers you enough space to live out your culinary ambitions. From the kitchen you have an access to the terrace. An oasis of peace is offering you a nice living room. Moreover there are 2 bedrooms with a double bed each and an other bedroom with 2 single beds. You also find two bathrooms in the apartment, which are provided with a shower and a bath tub. The second apartment also has 4 rooms. There is 1 bright bedroom with 2 single beds and 2 another bedrooms, with a double bed each. The big kitchen offers just like the one in the other apartment, much space for your culinary skills. In this apartment you also find 2 bathrooms, each provided with a shower. The highlight of this holiday house are the wonderful patios, which are decorated with flowers and which have a surface area of 110 sqm. Here you have a unique view on the wonderful mediterranean nature. On the patios you find garden furniture, sun beds and a parasol for you to relax. In the evenings you can enjoy the moonlight reflecting itself and the Island “Isola Bella” in the sparkling sea. Let the roar of the ocean lull you to sleep and enjoy here a holiday that you’ll never forget. To reach the beach and to enjoy the cooling water you have to drive only 5 minutes by car. In the evenings you can take long walks on the beach and enjoy extraordinary moments watching the sunset as she was diving into the ocean. Enjoy unique moments here – romance, fun, relaxation or adventure – whatever you are looking for you’ll find. To reach the nearby restaurants, bars, pubs and stores it is just a few minutes to walk. To reach the historic center of Taormina you have only to take a 6 minutes- walk. In the historic center you’ll find many typical restaurants and bars hat will spoil you with exquisite specialties. Go on a culinary journey to discover local dishes and taste different Sicilian wines. Recommendable is also a journey through the history of Taormina by visiting the sights. Dive in a colorful holiday that you won’t forget anytime soon.